Many of us who love golf are getting impatient right now. Last year's historic heat wave in March spoiled us with an early start to the season. At first I thought posting a series of pictures from March 20, 2012 would be a little saddening with our high today around 24 degrees, but then I decided to see the glass half full: These pictures from a year ago today are what we have to look forward to soon! It may take another few weeks, but the vernal equinox has happened, days are getting longer, and warmer temperatures are just around the corner. This winter, we began removing Ash trees infected with the Emerald Ash Borer (EAB) that were visibly declining or dead in 2012 and deemed hazardous to people or property. So far, 44 of 286 Fraxinus (Ash) species trees have been removed leaving 242. All of the remaining are infected and in various states of decline. The EAB is a non-native, phloem-feeding insect that aggressively kills both healthy and stressed Ash trees of all ages. The EAB adult, a metallic green beetle, lays eggs in the bark of Ash trees. These eggs hatch into larvae which bore through the bark and into the cambium where they feed, overwinter, and pupate. It is the larval stage which kills the tree once the cambium is girdled by feeding. See the USDA’s “Emerald Ash Borer Program Manual” for more information. The EAB was first identified in Villa Park in the summer of 2011 but we did not have conclusive proof on the golf course until February 2012 last year. During the winter from 2011 to 2012, woodpeckers were seen attacking Ash trees and leaving light-colored marks where the bark had been peeled away. These marks are the easiest way to identify EAB infection over the winter. 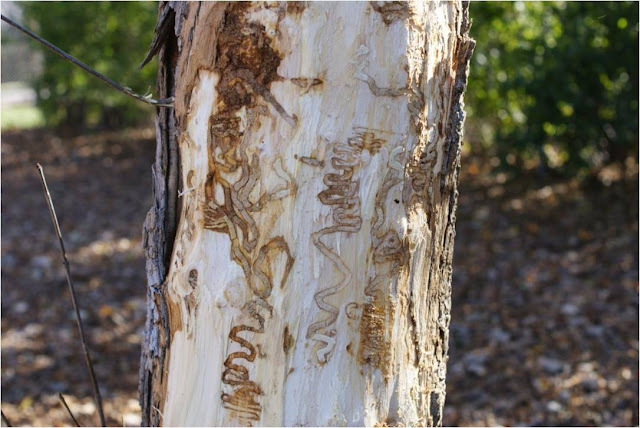 While the woodpeckers may be feeding on native borers that attack stressed trees, if the tree was previously healthy, EAB is strongly indicated. By the time you see woodpecker damage, the borer has already done significant damage during the year. It is best to call a professional arborist as soon as possible to determine a course of action. Many people ask me whether they should treat their Ash trees with pesticides or remove them. There is no easy answer to that questions. Ash trees can be saved even after infection with the right treatments -- this is true. The important thing to remember is that treatment is forever or, more accurately, for the life of the tree. If you miss treatments or happen to be in the small percentage where the treatment is ineffective, the tree will again be at risk of infection. The other important thing to remember is this: no matter what you do, you still have an Ash tree. Ash trees are not long-lived or structurally strong. They tend to suffer severe storm damage later in life and can be hazardous. As you might have guessed from the above, it is my opinion, verified by a lot of calculations, that it is almost always more desirable and cost-effective to remove an Ash tree and replace it with a more disease-resistant, longer-lived, and safer tree. I know many arborists selling treatment will argue with me, but the math is not on the side of treatment in the vast majority of cases. If you have an Ash tree that you consider invaluable to your property and it is in good condition and it isn't too old and it is not likely to become a hazard, then I would consider treatment. If not, cut your losses and plant something else! The graphs below were created using the Purdue EAB Cost Calculator﻿﻿﻿. As you can see, with Sugar Creek's large Ash population it is not cost effective to try and save all of our Ash trees. 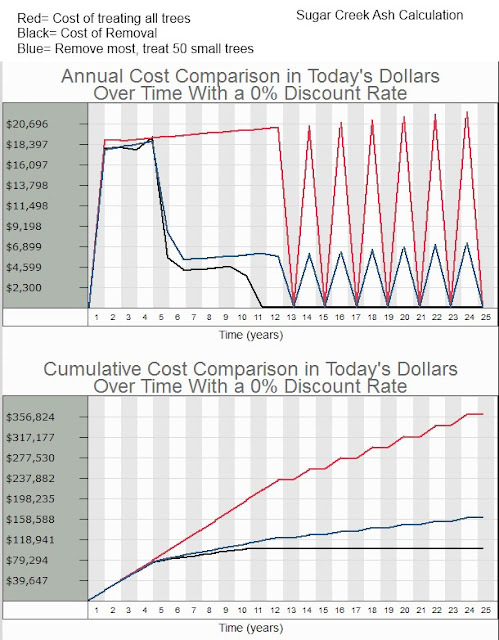 These costs are Purdue's estimate and may be higher than we could do the work for, but the relative costs are what counts. With a removal program combined with replacement of the landscape trees over time, the cost of the strategy disappears in 10 years or so. With treatment, it never disappears and the trees will still die some day with age and storm damage. Below is a picture of Ash storm damage. After almost every wind event, some older Ash trees need to be pruned or removed. This is true for both golf course trees and street trees. Most of the Ash trees at Sugar Creek are older and were in decline before the borer arrived. They were becoming hazardous to the clubhouse and driving range net, so their removal will give us a chance to plant trees more suited to the location. 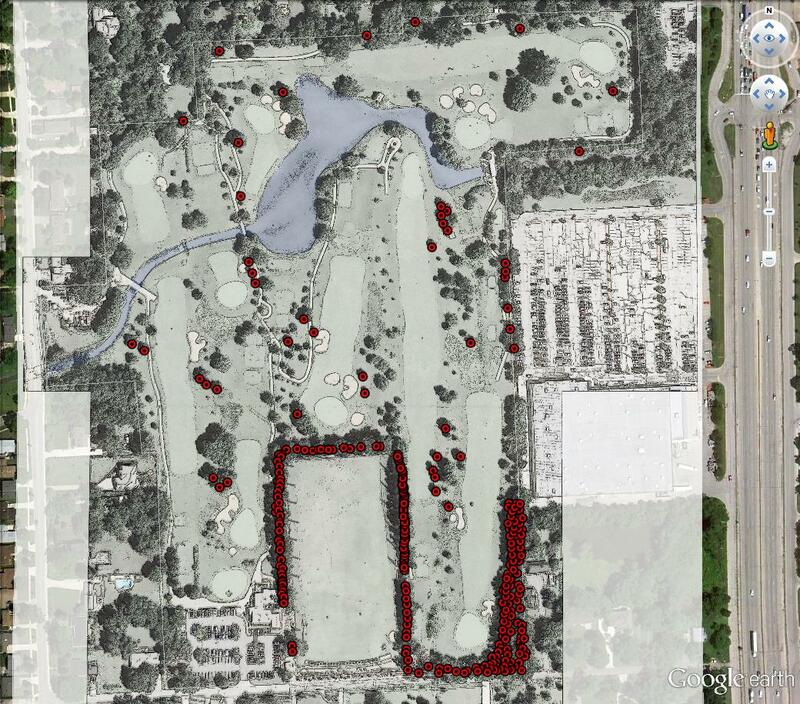 Most of the Ash trees at Sugar Creek are located along the fencelines around the driving range and on the 6th hole. Over the next few years, these trees will be removed and replaced with a variety of disease-resistant trees and shrubs. We are beginning replacements for the 44 trees removed this winter this spring behind the 6th green. During the winter, golf course equipment needs to be maintained and serviced for the year. We have finished our long list of preventative maintenance tasks and have moved on to the projects that can add new life to old machines or extend the life of a newer machine. Rusty mowing decks get scraped and repainted. This adds many years to the life of these decks. If allowed to rust, the structural integrity of the deck is compromised. This year we tried a product called "Rust Reformer" as a primer after wire brushing off the loose material. It claims to "convert" rust to a paintable surface. Not sure what what that means, but it sounds good. Time will be the judge. As auto body workers have told me, inspired by Neil Young of course: rust never sleeps. Our 1996 sprayer now sports new plumbing and a "Cleanload" eductor on the side. This is the black container on the side. It will be used primarily for disolving granular fertilizer and mixing it into the tank. Many people aren't aware of this, but we actually use our sprayer most often for fertilization. These are just a few projects that the Superintendent and Equipment Tech completed over the past few months. We are ready to turn our attention more to the outdoors! Spring is coming soon.